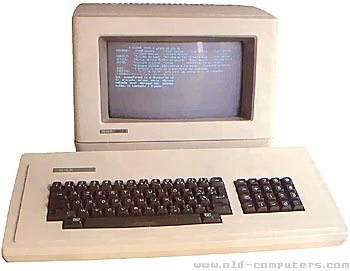 The model 820-II is basically a model 820 with a higher clock rate (4 MHz instead of 2.5 MHz) and a 8" double density/double side disk-drive and hard-disk instead of the the two basic 8" Single density/single side disk-drive of the first model 820. But the hard-disk is said to be very noisy and the dual disks weigh more than 38 pounds! Nearly all the hardware is housed within the monitor, a bit like a Macintosh. The separate keyboard is linked to the monitor by a "not-long-enough" cord. The 8" disk-drive and hard-disk are mounted in a separate huge box. The 10MB hard drive for example was boxed with an 8" drive. A real-time clock is included in the hardware. Green screens were available in all models since the screen/processor case was common to all. Like its predecessor, the 820-II is well furnished in software of all sorts. Thanks to its CP/M compatibility nearly every profession can find a suitable program. A lot of languages and OS were also available (CP/M, Basic 80, C Basic 2, Assembler Macro 80, Cobol 80, Short 80, TTY communication, 3270/3780 emulation). But the 820-II has no real graphic possibilities nor sound, and a small RAM capacity (64 KB) for a professional computer. Above all it was quite expensive compared to its competitors. There was also WP dedicated versions with unique key caps. A 16-bit expansion board was released to upgrade the 820-II, so that its performance would nearly match the new Xerox computer(the 16/8), and also allowed the 820 to work under DOS. At the start of the year 1985, Xerox would definately leave the micro-computer market and stop the production of the 820. I started working for Xerox in 1983 as a PC tech in the Xerox Service Center a sevice/support part to the retail store they had back then. 820-II's were the next step after 820's they were already double density instead of upgraded like many 820's were. They also supported double sided drives. The drive choices were 5.25" dual drives single or double sided, 8" dual drives also single or double sided and the top was a 8"double sided floppy paired with a 8" 10Mb Shugart hard drive.The 8" double density, 2-sided floppies had a capacity of 960K which was a lot for back then. BUILT IN MEDIA one 8'' disk-drive (DD/DS) (320 KB) and one 8'' hard-disk (10MB). see more Xerox 820-II Ebay auctions !